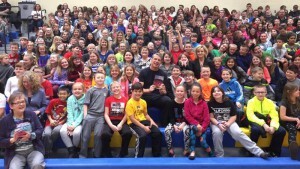 Students from Ellis Elementary, East Buchanan Elementary, Clinton County Middle School, and East Buchanan Middle School all had the opportunity to hear author and former NFL football player Tim Green speak at East Buchanan High School in Gower on Thursday, March 30. Green told the children how books can be a “game changer” in their lives, how reading can make a person smarter (Reading is Weight Lifting for your Brain) and how you can experience so many things through reading. He also emphasized that through those experiences, he feels reading can help a person become kinder. Pat Williams, Library Media Specialist for the East Buchanan School District, arranged Tim Green’s visit. 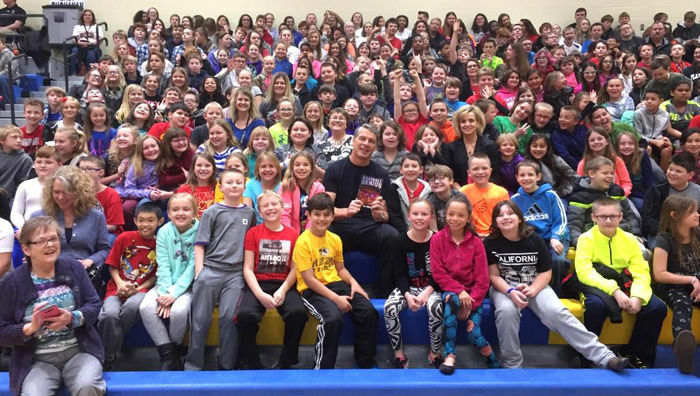 “We were very fortunate to be a part of his inspiring presentation. Our funding and transportation was provided by Scholastic Book Fair profits and PTA,” said Diane Shryock, Clinton County R-III librarian. Tim Green not only writes wonderful sports books for 4th -8th graders, but has also written more than a dozen books for adults. After studying writing at Syracuse University, where he was an All American football player, Tim was drafted in the first round of the NFL draft by the Atlanta Falcons, where he was a top defensive player for eight years.